Dickie Knee is dusted off this week for an appearance on ONE’s Darren & Brose. Also appearing are Julia Morris, Max Walker, Sam Pang, Steve Moneghetti, Christie Whelan-Browne, Krista Polvere -and someone called John Blackman. 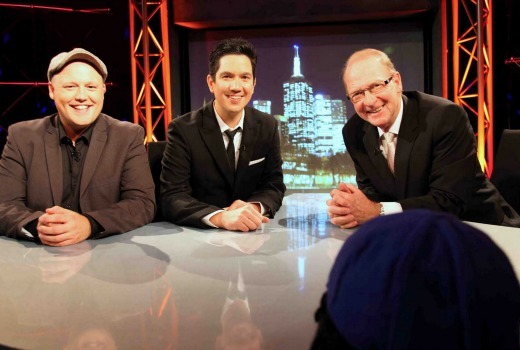 Guests joining Darren & Brose this week are the legendary sportsman, broadcaster and author Max Walker, comedian Sam Pang (Have You Been Paying Attention?, Eurovision, Santo Sam and Ed), marathon great Steve Moneghetti and Hey Hey it’s Saturday’s Dickie Knee, who cheekily turns the tables on our two hosts, giving them an absolute roasting. Plus Australia’s first lady of comedy Julia Morris and Helpmann and Green Room Award nominee Christie Whelan-Browne (Wonderland, Shane Warne: The Musical) return for more fun and hilarity and there’s music from singer-songwriter Krista Polvere. Thursday, July 16, at the special time of 10:45pm on ONE. Not sure why TEN couldn’t have used 15 min of filler Movie Juice content on ONE like they have been doing on their main channel during the day so the start time didn’t change from the 11pm advertised timeslot.